Sometimes, when thrilled by the stunning beauty of a place, people call a location "heaven on Earth." Nowhere is this description more appropriate than in the tropical rain forests of Papua New Guinea, Indonesia, and eastern Australia, which are blessed with unique and spectacular birds known as birds-of-paradise. In striking contrast to their female counterparts, these birds are bewitching by virtue of their amazingly colourful plumage. The misconception that these visitors from paradise are kept aloft by their plumage and that they never touch Earth till their death makes this an interesting subject of study. Have a glimpse at these brightly coloured and attractive birds. 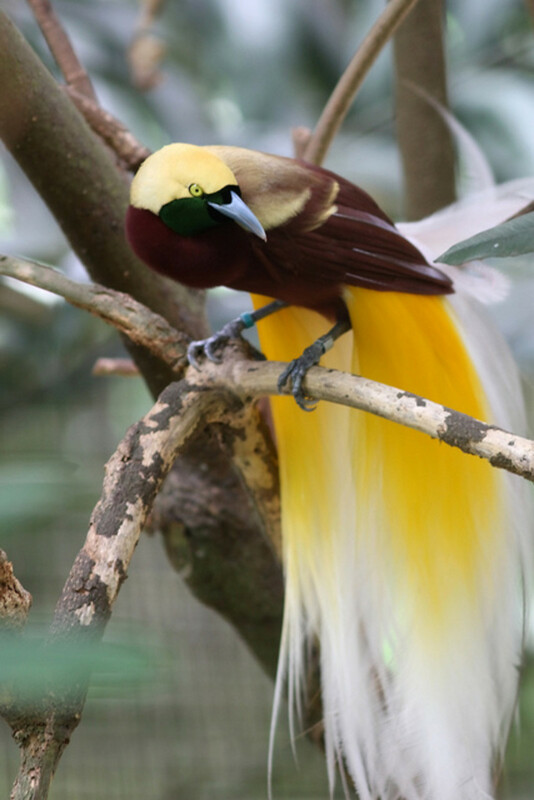 Wilson's bird, one of the most spectacular birds-of-paradise, is endemic to Indonesia, primarily in the lowland rain-forests and hill forests of around 300 meters in the West Papuan islands of Waigeo and Batanta. This small bird is known for its peculiar colours. 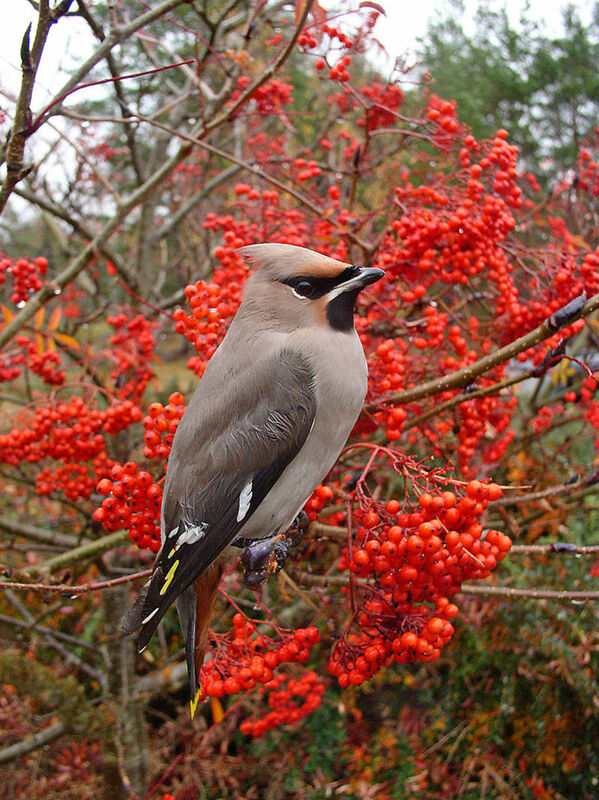 The male is mainly red and black. It has a yellow cape and a turquoise crown, which is only a patch of bare skin with a double-cross blackish pattern on it. It has green breast, rich blue feet and two curved violet feathers. The female is entirely different, which is brownish with a bare blue crown. The males are known for their peculiar appearance, and for displaying splendor of their colours during courtship. 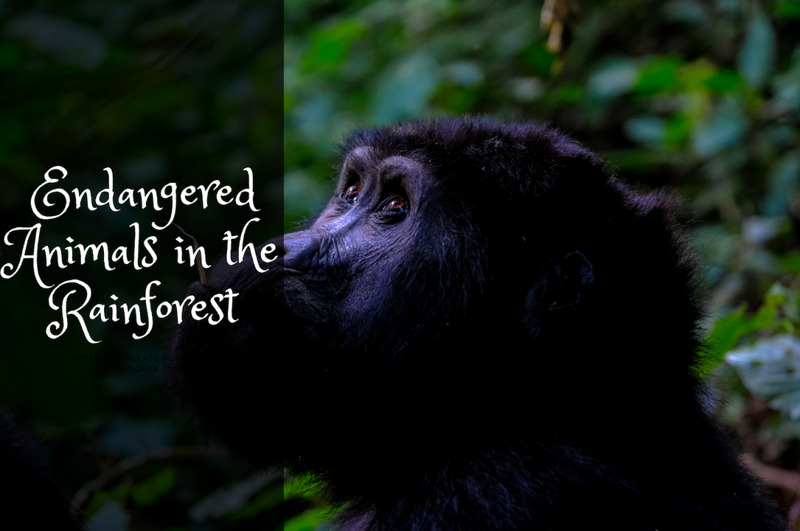 They eat fruits and small insects, and have been placed in the near-threatened category due to habitat loss. 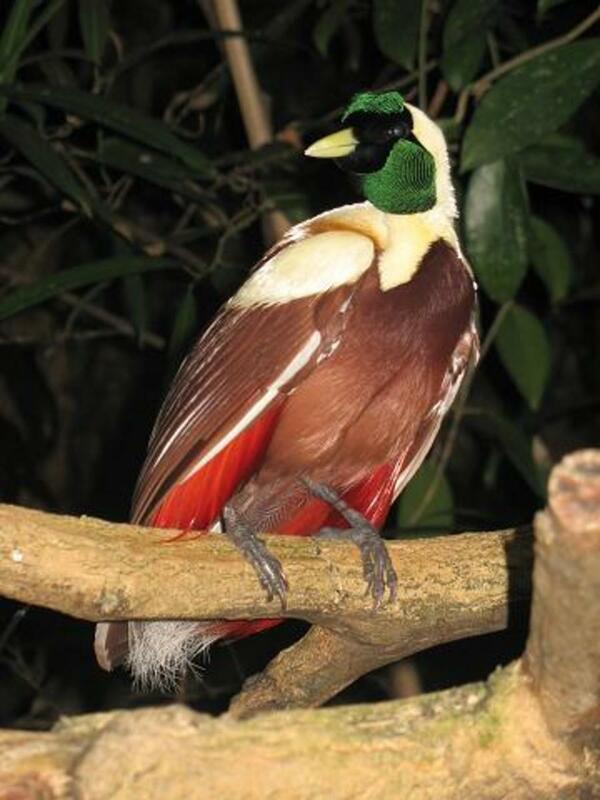 The king bird-of-paradise, a passerine, is the smallest and most widely distributed in the lowland forests of New Guinea and the nearby islands. 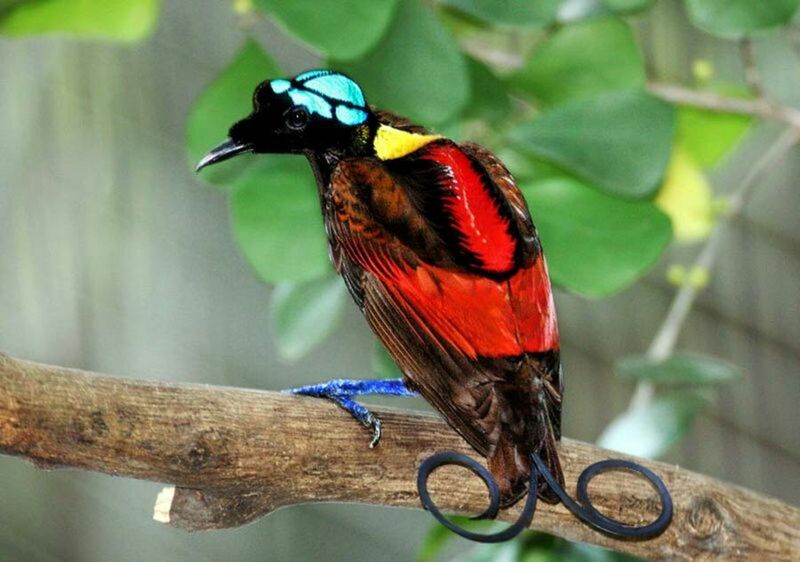 Approximately 16 cm in length, it is also recognised as having the most vivid colours among birds-of-paradise. The combination of crimson and white with bright blue feet makes it a king. Its shoulders have green-tipped, fan-like plumes. Another distinguishing feature is its two elongated tail wires, the tips of which are beautifully decorated with emerald green disk feathers. As usual with these birds, the females are unadorned. They are merely brown birds with barring below. They eat fruits and arthropods and are widely spread in New Guinea, classified as a bird of "Least Concern" in the conservation status. 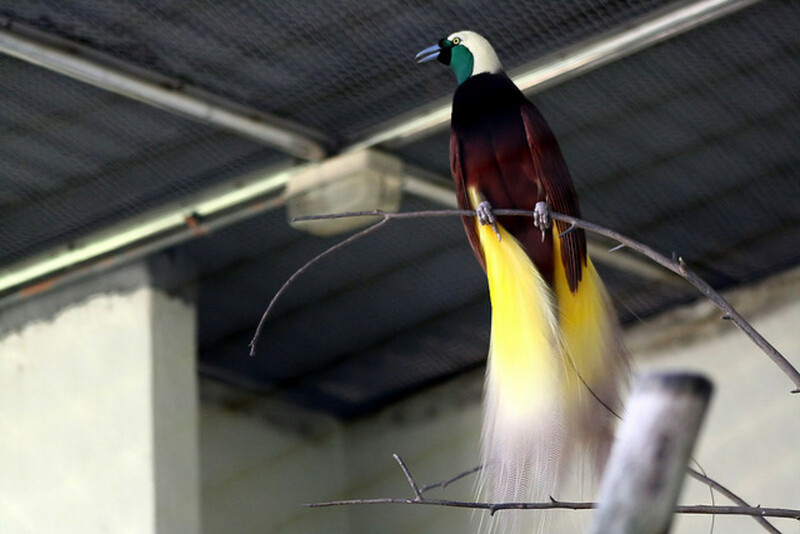 Also called a kumul, the Raggiana Bird-of Paradise is widely distributed in southern and northeastern New Guinea and is the national bird of Papua New Guinea. 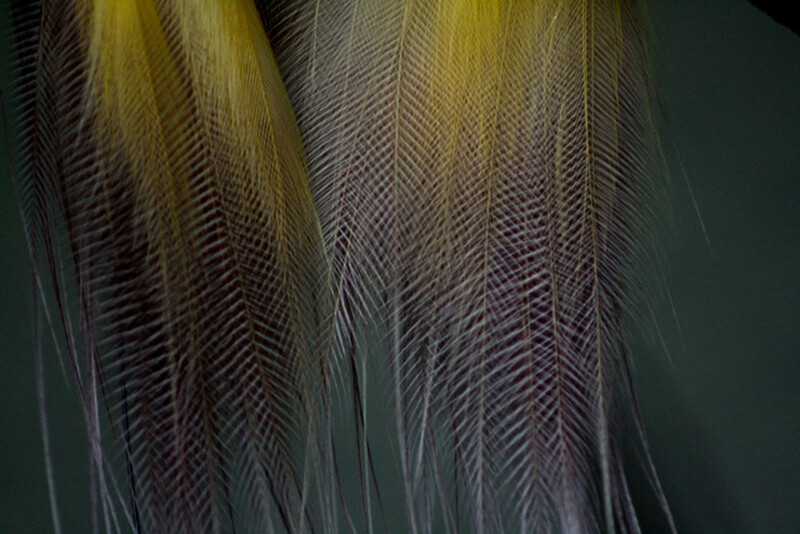 It is popular because of its spectacular coloured feathers, which are collected and worn during local festivals and ceremonies. It is about 13 inches long, maroon and brown with a greyish blue bill. Males have a yellow crown and a dark emerald-green throat. As usual such birds, the females are relatively dull, with a maroonish-brown colour and short tail feathers. This bird eats fruit and arthropods and is quite famous for shaking its feathers, clapping its wings and moving its head to woo partners. It falls into the category of "Least Concern" in the conservation status. The red bird-of-paradise presents an unusual appearance because of its glossy red feathers. 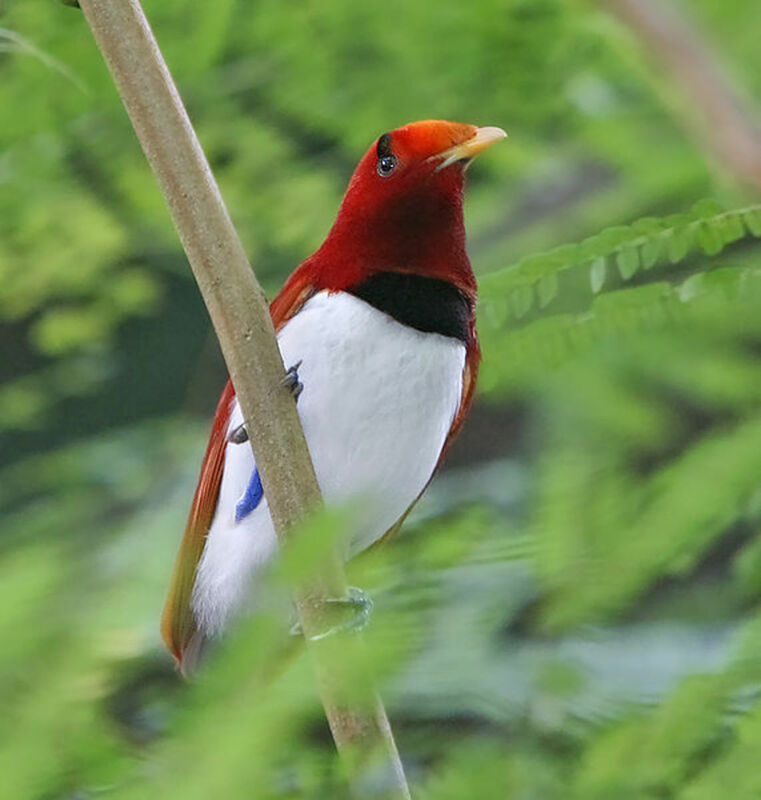 Endemic in Indonesia, this beautiful bird is found in lowland forests and hill forests up to 600 meters in elevation in the Waigeo, Batanta and Gemien islands of West Papua. The male is brown and yellow, his iris is dark brown, and his legs are grey. The bill is yellow, the face is emerald green, and the plumes are ornamental red. The female is smaller in size, without ornamental red plumes and a with a brown face. They eat fruit, berries and arthropods. During the breeding season, the males attract females by performing elaborate courtship displays. 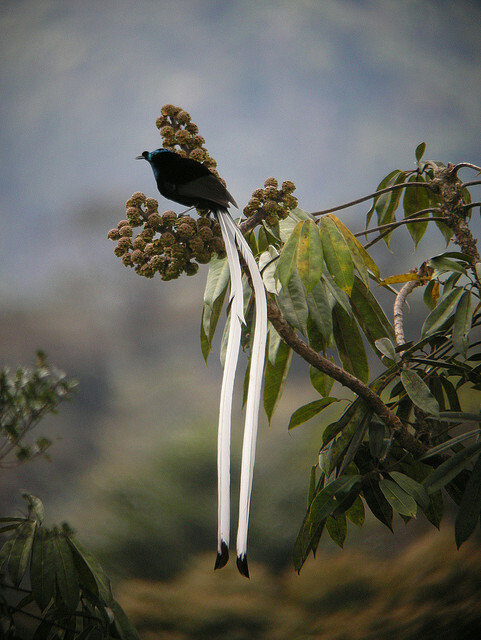 Known for their three-foot long white tail, ribbon-tailed astrapia are found in restricted ranges of the sub-alpine forests in the central highlands of Papua New Guinea. With a velvet black body, the males have an olive green and bronze plumage. They also have long ribbon like tails which can cause trouble during flight. The large purpose of their long tail feathers is to attract females. Female astrapias are brown and do not have the long tails. These birds use their bill to dig out insects from trees and ground. They also love to eat fruit. This is one of the largest species in the lowland and hill forests of southwest New Guinea and Indonesia. The male has a yellow crown, head and nape, with a brown back. The beautiful flank plumes are yellow at the base, but turn white with maroon streaks further down. The plumage of the female is unbarred maroon. In both sexes, the bills are blue and the iris is yellow. These birds love to eat fruit, insects and seeds, and are not endangered. Victoria's Riflebird is very small. It is endemic to wet tropics in the Atherton Tableland region of northeastern Queensland in Australia. It resides in lowland and hill rain-forests, and is one of the birds-of-paradise indigenous to Australia. It is named after Queen Victoria of England, possibly due to the resemblance of its plumage with the colour of the uniform of riflemen in England. 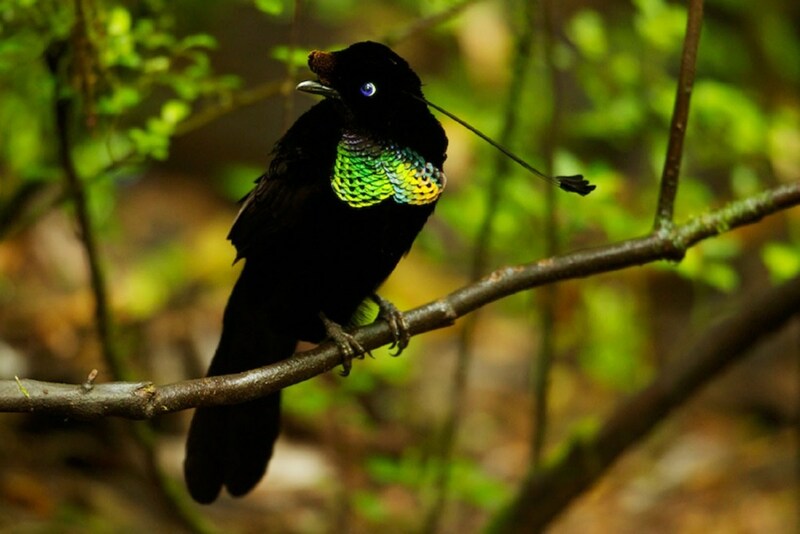 The males have beautiful jet black plumage with a sparkling green head and throat. They are known to make very elaborate performances, twisting and swinging their heads to impress females, who are red-brown in colour. 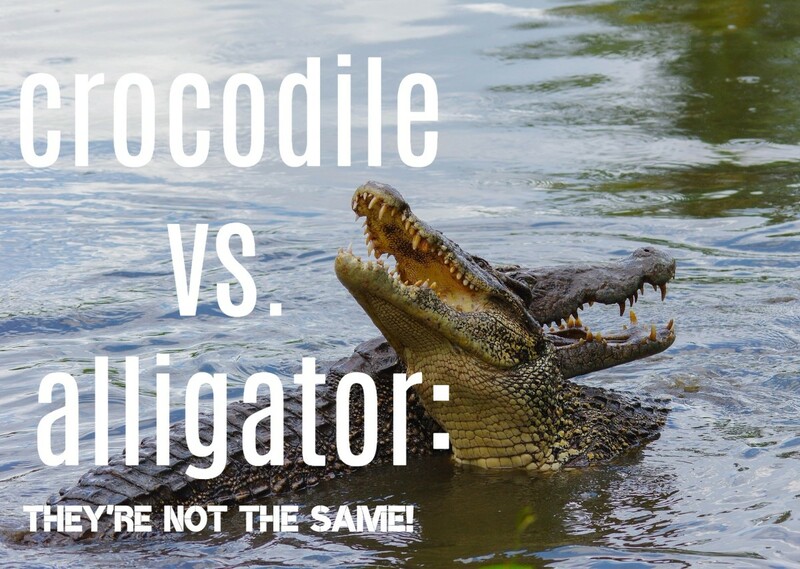 They eat small insects and fruit. They use their long-curved bills for tearing tree bark, much like woodpeckers. Famous for its 12 wire-like filaments emerging from rear of its beautiful yellow plumes, this bird of paradise is velvet black in colour. It has a long black bill and a red iris. Its feet are pinkish and long-clawed. Females are brown. Its behaviour during courtship is noteworthy. The 12 wires are brushed against the female's face. This bird is of "Least Concern" in the conservation status, and is distributed throughout New Guinea and Salawati in Indonesia. 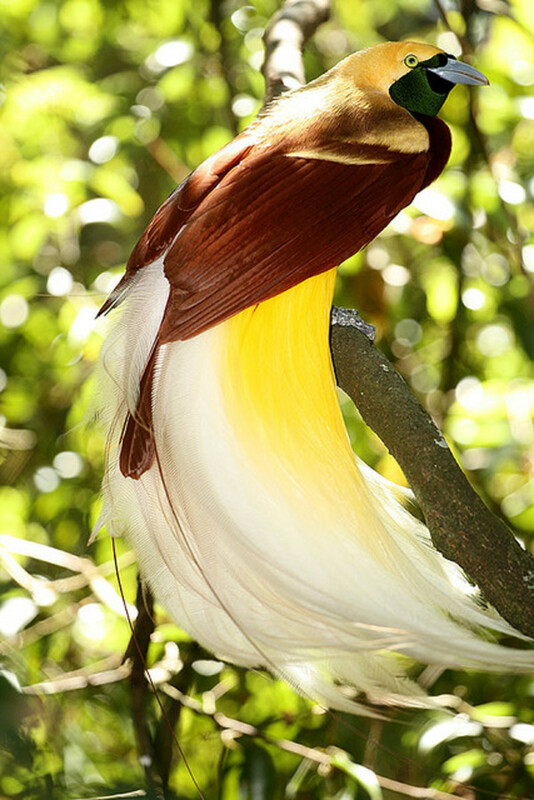 The lesser bird-of-paradise is often found in lowland forests, and swamp forests in Northern New Guinea, Misool and Yapen. They are medium-sized. Males have dark, emerald-green throats with yellow heads and backs. 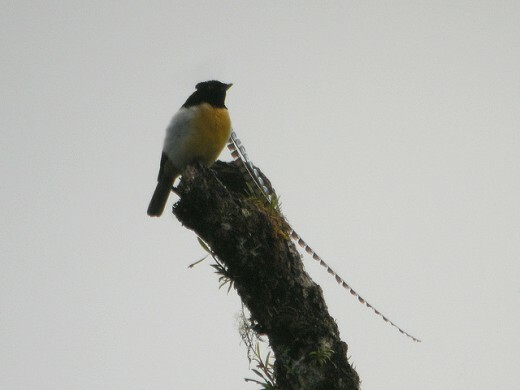 They have a pair of long wires protruding from their tails, and have spectacular flank plumes which are yellowish at the base, fading towards the end. Females have a dark-brown head and whitish underparts. Eating mainly fruit and insects, the polygamous males are known for their courtship displays, in which they perform undulating and floppy flights. 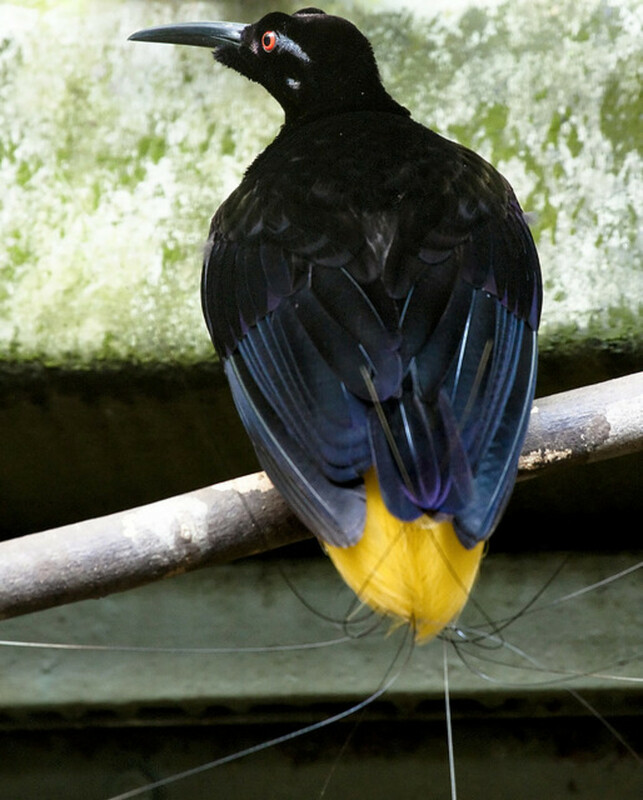 The king of saxony bird-of-paradise is found in the rain forest regions of New Guinea, ranging from Weyland mountains, to Kratke in Papua New Guinea. The natives call it 'Kiss-a-ba,' which sounds much like the males loud call. In appearance, the male has a black head and chest with a buff-yellow underbody. It has a long, ornamental head plume, which plays an important role during courtship. The female is greyish brown. 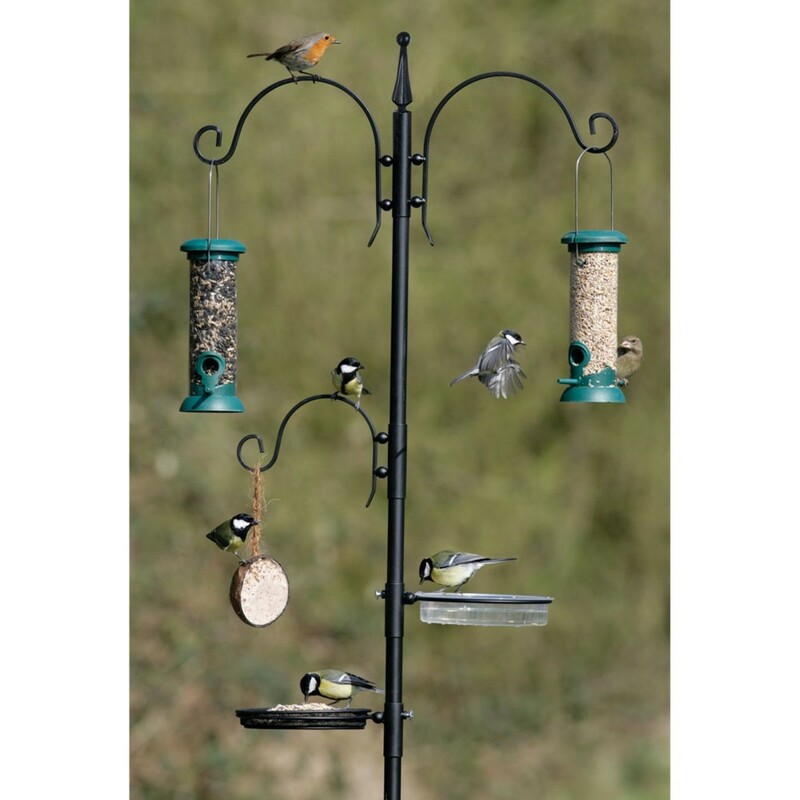 Fruits, berries and arthropods make up the primary diet of these birds. The males are known to make a hissing sound. This bird is of "Least Concern" in the conservation status. Which of the ten birds-of-paradise appealed you the most? Kelly, these birds deserve to be called Birds of Paradise. I am glad to know that you plan to have paradise in a corner in your house. Thanks for visiting. Have a nice day! I have decided to "decorate" my powder room with birds of paradise prints - antique chromatography prints from the turn of the century. I was 85% sure this was the direction I was headed until I read this hub and now I am 100% sure and very much energized. Thank you! Excellent photos and descriptions. Just beautiful pictures! Great hub! Thanks, Blackspaniel1. I am glad you liked the birds. I wish I could see some of these. Have a nice day! These are great, yet none of them fly here. we have birds, but none to compare. Alun, I am grateful to you for the thought-provoking comments. They need to be carefully observed to understand their behaviour and beauty. I wish I could get a chance to see some of these. Thanks for visiting and have a nice weekend. Beautiful photos and excellent introduction to the extraordinary plumage of the birds of paradise. They are truly amazing birds. I voted for the Greater Bird of Paradise in your poll, but in truth the loss of any of these would be a tragedy for the world. 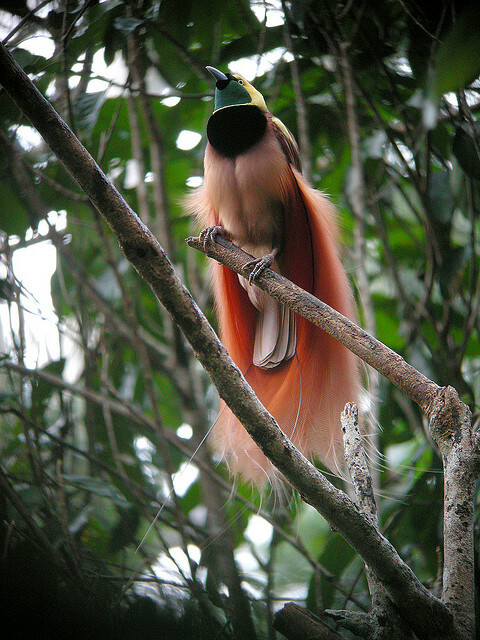 And it should be made clear that colourful plumage isn't everything, even among the birds of paradise. Indeed some of the species with rather less spectacular plumage, compensate for this by having the most spectacular courtship dance routines and bizarre, out-of-this-world songs. Radhika, it was quite thrilling to know and collect information about these birds. They are certainly not misnomers. Thanks for stopping by and all the support to this Hub. Have a nice time! Inexplicable! I was having an out-of-the-world experience while going through this hub. These birds really impart a paradise ambiance wherever they perch. Such is their beauty being weaved by the eternal hands of God!! Voted up, beautiful, useful, awesome and interesting. Sharing in Hubpages. aviannovice, People have gone there and photographed these birds. But I agree with you that it is difficult. It is better we enjoy the paradise without entering the territory. Thanks for stopping by and have a nice day! travmaj, Thanks for stopping by. I am glad you liked the birds. They are really magical. Have a nice day! This is delightful, such beautiful birds, I can't choose one, they are all so delightful. What stunning colours. I enjoyed this hub very much. literal, thanks for stopping by. It is difficult to be believe that they are there on this earth. I wonder if you have seen any of them. Your support for the Hub is welcome! Have a nice time. 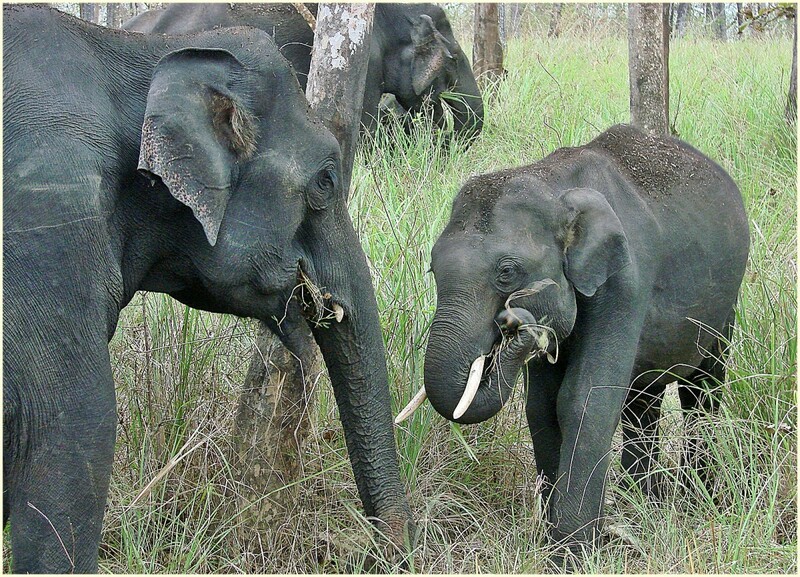 Sunil, I am glad you liked these wonderful creatures. It is difficult to imagine their beauty and I wish I could see some. Thanks for stopping by. Have a nice time. bethperry, I am glad you enjoyed the birds of paradise. I wish I could watch a few of them in their paradise. Thanks for visiting and have a nice weekend. It a wonderful article with stunning photos of some beautiful birds. I love these birds very much and what we call them is Love Birds. Watching them is a delight. You made my night with these beautiful photos! I voted for the ribbon-tailed astrapia, but it was a hard call to make! Thanks for stopping by, Kevin. 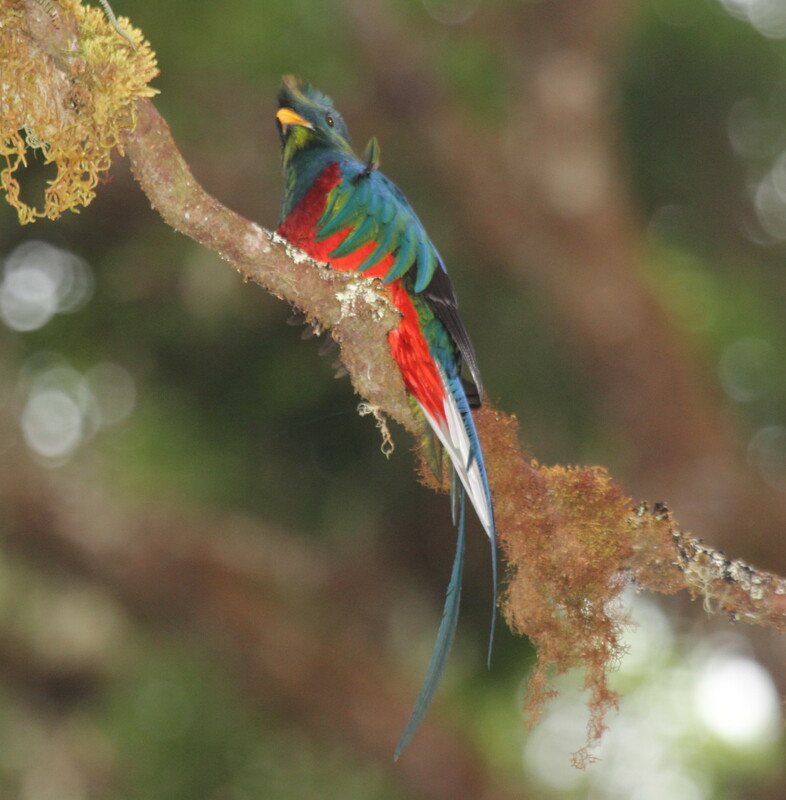 They are really colourful birds and are still surviving in their paradise, a small part of this earth. Have a nice weekend. This was superb and it had beautiful photos of the birds. I loved perusing the explanation of each bird while I kept examining the color illustration of each Bird of Paradise. 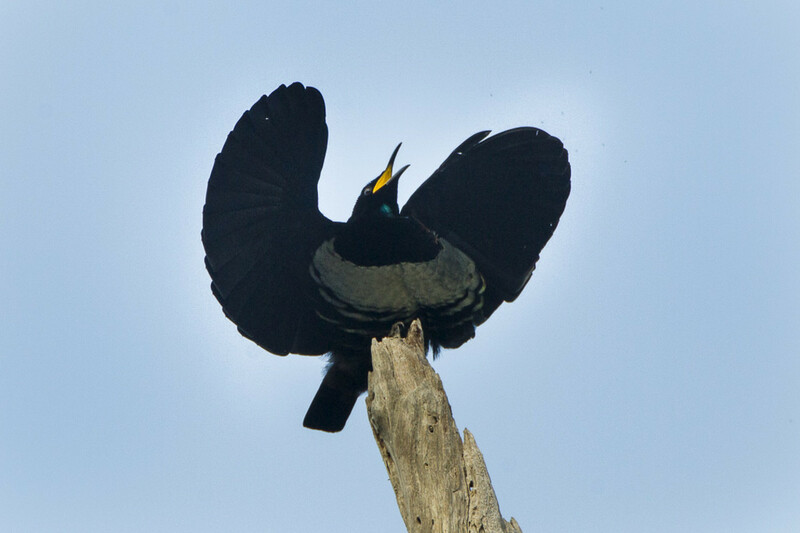 My favorite was the "Victoria's Riflebird". I gave this thumbs up and shared it.